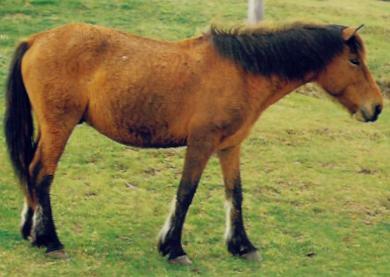 Misaki Horses (Misaki uma in Japanese) are as tall of a pony, yet they have many horse characteristics and proportions. The first reference to Misaki Horses is in 1697, when the Akizuki family of the Takanabe Clan rounded up feral horses and developed a pool of breeding stock. However, following the end of World War II, Misaki horses were designated as a National Natural Treasure and nowadays they have returned to feral life, mainly in a designated National Monument on Cape Toi at the south end of the Miyazaki Prefecture, attracting many tourists to the region. Source: Japanese Horse Breeds ( www.lingualift.com/blog/japanese-horse-breeds/ ).